Auto repair and service shops find themselves burdened with used oil filters every year; sometimes thousands all full of used engine oil. They are viewed as contaminated waste by the EPA and must be processed for disposal and/or recycled. All disposal is regulated by the EPA. 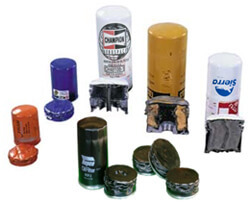 Used oil filters can be processed into both used oil and recyclable steel remnants. The oil can be refined in to a lower grade lubricant oil or possibly fuel and the steel remnant can be recycled into new steel products. Annually in the United States, properly recycled used oil filters result in about 160,000 tons of recovered stee l.
Recycling is the most popular and safest alternative to disposal. Using a crusher is more productive and less expensive. An oil filter crusher uses high pressure and squeezes the engine oil sludge and grime out. Within seconds used filters are reduced to 1/4 of their original size. Resulting in a collection drum filled with recyclable metal to be sold and a storage container of used oil to be recycled. Because most disposal companies charge an enormous fee per drum to remove the metal and oil, the more recycled filters you can fit into each drum means less $$ spent. And you are complying with EPA disposal guidelines. In addition, permits are not required if these filters are being recycled. One step process is used when crushing used oil filters and removing any left over oil. It leaves the rubber content and paper with the resulting scrap product. And is burned away during any steel making recycling. Service and Repair shops that recycle used oil removed from the filter and filter casings as scrap metal are exempt from any hazardous waste regulations. No testing required. 1. Use a Gravity Drain and filter for an unknown amount of time, what ever time is required to ensure that all oil is removed. (This method is problematic because the drain time varies based on the filter size and temperature and the fluid thickness). 2. Best option: your service and repair shop crushes the oil filter using a crushing method that forces excess oil from the filter. The Ranger RP-20FC connects easily to your existing shop air supply and is designed to crush dirty even filthy oil filters and then remove up to 95% of the sludge. A collection downspout and chamber provides simple recovery into any storage container. 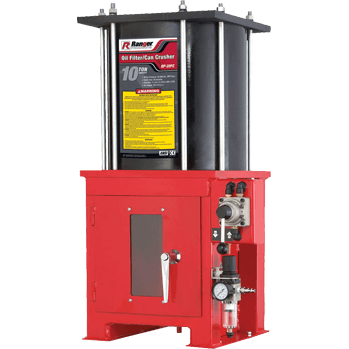 The Ranger RP-20FC oil filter crusher uses 10 tons of pressure (air-operated) to any used oil filter and reduces it to 1/4 its original size. Featuring a welded steel plated construction, 12 1/2" cylinder diameter, a single‐control valve operation plus a pressure regulator with air moisture separator this crusher also has an automatic safety door that stops the press from operating if opened. You can also see the whole process through the clear door. Priced at about $1,300.00 and including free shipping to almost anywhere in the United States. The cost savings for protecting our environment and your shop along with reducing the size of used oil filters and recycling, and the money you save because you don't have to buy permits for EPA, makes this purchase an investment that speaks for itself. Many states vary in the laws regarding what is required of used oil filters, some require them to be drained for a period of 12-24 hours, unfortunately many service and repair shops don't have the time to process this way. They typically use a gravity drain and drain the oil filters for only a few minutes then discard them into the trash. But a large amount of oil remains inside and is improperly drained and is now hazardous waste. You will be fined for improper and illegal use of hazardous waste management if violating the proper procedure. Oil that is used, is a pollutant, all used oil should be completely drained from used filters then recycled or disposed of properly. However, all oil processed from used oil filters need not be required to be regulated as a hazardous waste and it can be recycled if managed and transferred properly. 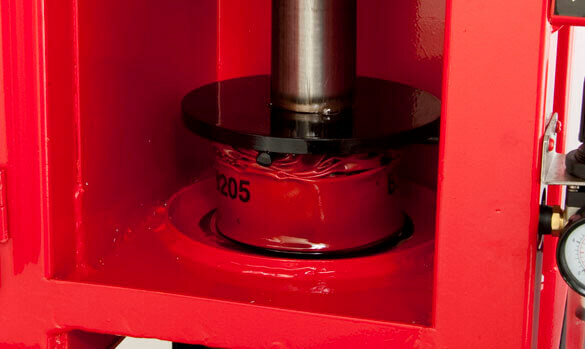 An optional sturdy metal can crusher stand is available for use with the Ranger RP-20FC Oil Filter Crusher. It has a design that accommodates large collection tanks ranging from 5 to 55 gallons. Just slide a storage barrel beneath the stand and the tanks are ready to receive oil (waste) directly from the downspout oof the crusher. Magnificently simple!.